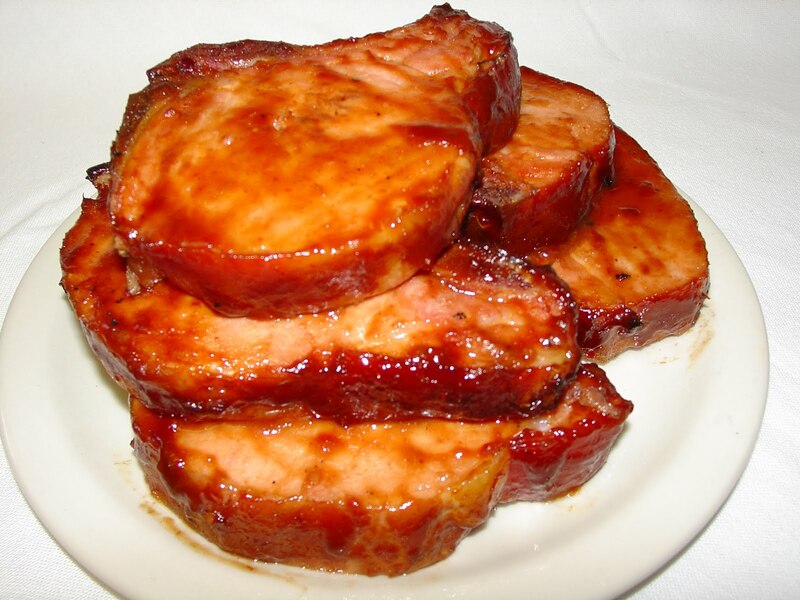 Hungry Jerks - Food Recipes and Restaurant Reviews: Recipes: Oven Baked Pork Chops... with a twist. If you're like me, you've found that Pork, of all the meats, can be the trickiest to cook. Furthermore, when cooking Pork in it's Chop form, it can be especially difficult to achieve the dish's maximum potential. Pork Chops tend to cook quickly and if you're not careful, it doesn't take much to overcook them, leaving them tough and dry. Hopefully this quick recipe will do for you what it's done for me, and that's save Pork Chop night! 1/2 Lime squeezed for juice. In a large bowl, mix ketchup, brown sugar, soy sauce, oil, chili powder, allspice and pepper. Make sure to take your time mixing these ingredients so that everything is perfectly blended. Dip the pork chops into the sauce, coating both sides. Then set to the side on a plate. The best thing to do if you're making these ahead of time would be to cover the plate with saran wrap and return to the fridge. Once the chops are to the side, add the prepped veggies to the mix and make sure they're equally coated. It's important to make sure your veggies are chopped the same size so they will cook evenly. Next, break out your tin foil. What we're going to do here is tear off 4 sheets about 8" by 8". Place the Pork Chop in the center of the sheet and then scoop about 1/4 of the veggies on top of it. Fold your foil square up to create a tightly sealed pocket for the Chop. Repeat this process for your other three Chops. Place all 4 individually wrapped chops on a baking sheet. Bake in the oven for approximately 35 minutes, using a meat thermometer to check your temperatures. Serve Chops with their cooking juices and the veggies, side with rice, fresh veggies, bread, or whatever you might like. Sounds delish Devon! I hate dried up chops too! I tend to cook in bulk as to spare myself a day or two in the kitchen, so I brown up my chops, dash on salt, pepper, and garlic and herb old bay- then toss them in the crock pot with a can on diced tomatoes and peppers (Rotel) and a can of picante (mild)sauce. Its an amazing taste with unbelievable texture. Always looking for new chop ideas so thanks for sharing! It's always good when you know how to keep the chops moist.